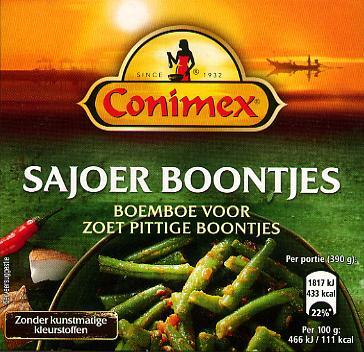 Conimex Tub 04 Sajoer Boontjes 95g - Conimex - The Dutch Shop LLC your store for Dutch groceries. A paste mix is a concentrated mix of spices from Indonesia, made of finely ground spices and seasoning. A paste mix is a convenient way of adding flavor, aroma and color to your dishes. This paste mix for Javanese Beans enables you to prepare the most popular Indonesian vegetable dish. Click here to see the nutritional information. Sambal Oelek 21% (red pepper, salt, lactic acid, water), vegetable oils (rapeseed, sunflower), maltodextrin, sugar, water, tomato paste, dextrose, garlic, onion, vinegar, tic acid, water), maltodextrin, monosodium glutamate, tomato puree, modified corn starch, soy sauce 3.7% (soybean, wheat, maltodextrin, salt), galanga, salt, burnt sugar, fully hardened palm fat, preservative potassium sorbate, aroma. Allergen information: contains CELERY, WHEAT, yeastextract. Refrigerate after opening, use within 3 days after opening.